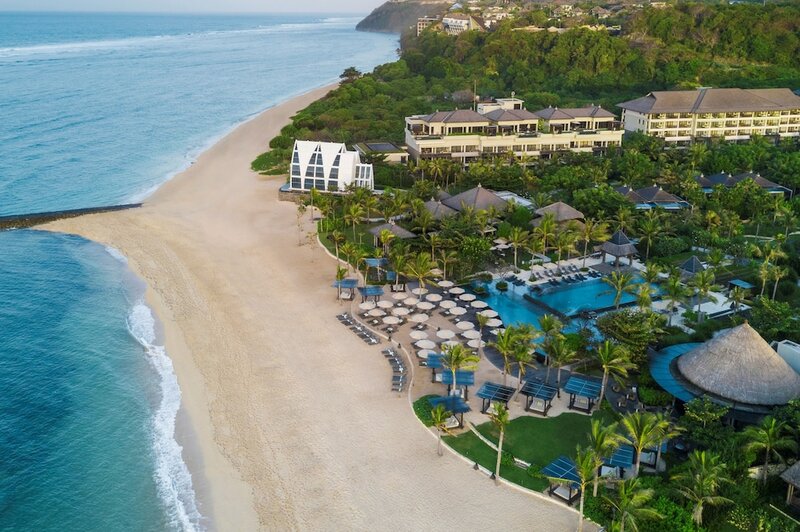 The Beach Grill at The Ritz-Carlton, Bali is one of the resort’s most laidback dining venues, making most of the airy beachfront garden setting overlooking Nusa Dua’s secluded coast of Sawangan. Interconnected by narrow ceiled aisles, a collection of separate dining pavilions with floor-to-ceiling windows and several wooden decks by the sand offer you a choice between cool and sheltered dining or breezy and alfresco seaside lounging. Complementing its main restaurant area is a thatch-roofed pavilion that serves as a fully-stocked, stylish and cosy bar, overlooking a green lawn and garden which separates The Beach Grill with the resort’s main pool. Here, rattan stools, cushioned sofas and an elegantly designed ice cream trolley welcomes families for fun moments under the sun, while evenings have The Beach Grill taking on a more refined and candlelit setting. After opting for a pavilion over its open kitchen area where you can glimpse over the chefs in action (due to being a tad too warm for us), we examine the menu that is a good mix of fresh seafood dishes and grilled specialties. Chef’s signature highlights range from tuna ceviche, Wagyu carpaccio, prawn spaghetti, salt-and-pepper lobster and stuffed quail. Our soft shell crab tempura at USD 14 (IDR 190,000) served with a sweet salad of lemon basil, watercress and sesame dressing proves a good start with its crunchy texture and fresh interplay of flavours. From the seafood grills we go for a Caeser salad with grilled spiny lobster, served with Romaine lettuce with croutons, bacon bits, parmesan slices and anchovies on top, and soft-boiled quail egg halves, at USD 29 (IDR 390,000). Non-seafood selections include a succulent 250gr Wagyu striploin, sliced into four and grilled to perfection, served with rock salt, baby carrot and baby turnip. After your meal, chill and relish your time at The Beach Grill’s beachside deck with a refreshing cocktail at hand. Drinks start from USD 5 to 6 (IDR 65,000 – 75,000) for tropical fruit juices, smoothies, beer and mocktails. Red or white wine Sangrias topped with brandy, Cointreau, mixed fruit, and lemonade USD 10 (IDR 145,000) are also great, as well as Ritz-Carlton, Bali’s unique signature blends such as Rujak Pelalah, a spicy Balinese inspired infusion of Bulleit Bourbon, cranberry juice, spicy syrup, lemon juice, tamarillo and horseradish, at 11 (IDR 150,000).